Sympatex - Our Cooperation Partners - Your partner for innovative functional textiles. Sympatex has decided to only be content if functional clothing is 100% created from a closed loop. But we can only achieve this together. The Sympathy LabTM offers the framework for this cooperation. It was founded on the initiative of Sympatex – as a start-up with 30 years of experience. With the Sympathy LabTM, we have created room for committed partnerships in order to jointly close the textile loop in a step-wise process. While the Sympatex membrane has already been produced in a 100% climate-neutral way thanks to its cooperation with ClimatePartner, Sympatex also helps its customers reduce their impact on the environment in a best possible way. Sympatex checks the complete process chain from the raw materials production to the delivery to our customers (“cradle to customer gate”). This lets the consumer follow the procedure, and the used CO2 is neutralised: a win-win situation for the company and the end consumer. More about the Sympatex‘ climate compensation via this link. Sympatex is partner of wear2wear. Five skilled partners in Europe have teamed up for this innovative partnership and cover the entire recycling cycle. The sustainable wear2wear concept is a synonym for high-quality and responsible clothing. New functional textiles are produced out of textile fibres of used pieces of clothing in state-of-the-art production plants in Europe. Depending on the field of application, they meet high requirements for waterproofness, breathability, protection and comfort. These textiles can be completely recycled at the end of their life cycles for closing the textile loop. The partners succeeded in presenting a high-quality and new product made out of old functional textiles – a functional shirt made of upcycled polyester fibres – at A+A (occupational safety trade fair) in autumn 2017. “Green Deal”: at Expoprotection Paris 2018: Collaboration between industrial partnership wear2wear and France’s recycling project FRIVEP. 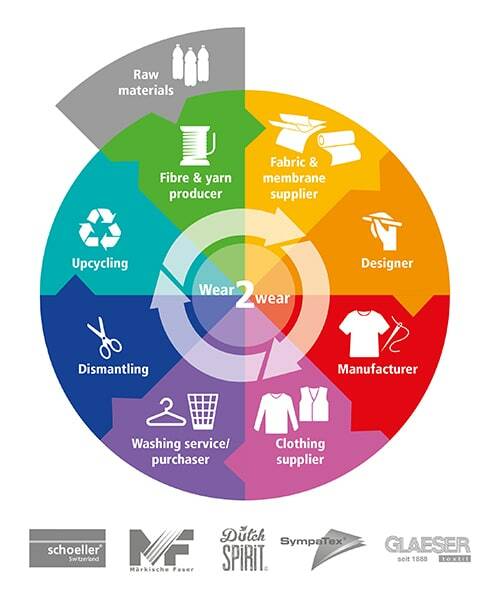 Specifically, the parties will join forces in developing far-reaching synergies between wear2wear and FRIVEP (Filière pour le Réemploi et Recyclage des Vêtements Professionnels) in order to bring used polyester fabric back into circulation in a way that ensures value retention. During the initial 15-month pilot phase, the French mail service, the French rail company (SNCF), the City of Paris and the national police, will collect more than 20 tons of clothing. The aim is to reuse most of the textile raw materials in the functional clothing sector. Sympatex is a member of the Sustainable Apparel Coalition (SAC). Sympatex joined the SAC in spring 2015 already, alongside more than 150 global brands, retailers and manufacturers as well as governmental, non-profit, environmental and academic organisations in order to promote together how to improve the supply chain in the clothing and footwear industry. The SAC offers different modules to evaluate sustainability through all stages of the supply chain – for brands, producers, commerce and products. The evaluation of sustainability is carried out within each SAC module by calculating the module-specific Higg Index. The modules are based on indicators that suppliers, manufacturers, brands and retailers can use to evaluate their materials, products, plants and processes regarding ecological questions and decisions concerning product design. The Higg Indexes are used to make decisions about the supply chain that lead to a better efficiency and sustainability impact. Sympatex works on the “Brand and Retail Module” and has therefore committed itself to an annual improvement of this company’s Higg Index. Furthermore, Sympatex creates the product-specific Higg Index MSI („Material Sustainability Index“) for the raw material portfolio. More information about the Sustainable Apparel Coalition is available here. Our industry has always preached about closeness with nature. At the same time, the calls for a more sustainable fashion industry are increasingly louder. 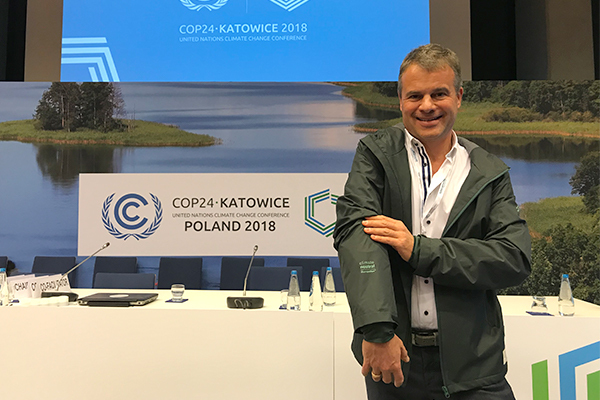 Much has been achieved over the years, from the initial efforts to eliminate fluorocarbons from DWR-based outer materials and the extensive development of recycling concepts, to a broad-based commitment to protecting the environment through COP24. Microplastics – The achilles heel of a circular outdoor and textile industry: As an industry, we are part of the global microplastics problem and one of the contributors to the man-made contamination of the environment and our waters, with still unforeseeable consequences for mankind and nature. We nevertheless lack clear information regarding the actual dimensions of the problem, and have yet to develop clear solutions that will prevent microplastics from entering the water system through wear or washing of functional textiles. As a pioneer in the field of green functional textiles, Sympatex wants to be one of the first in the industry to earnestly and quickly address this issue. 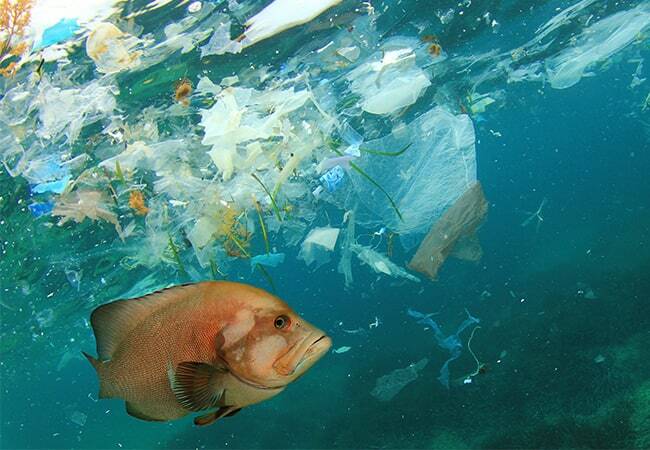 With this in mind, the Munich-based company is collaborating with a wide range of partners from government and non-governmental organizations and research institutes to quickly pinpoint the causes of microplastics, especially in the fashion industry. One of the key goals here is to rely on data collection to develop solutions that can then be used to eventually tackle the creation of microplastics directly at the source. Sympatex cooperates with Plastic Soup Foundation, PlanetCare, the Italian Institute IPCB-CNR and the Plastic Leak Project, an initiative of the management consultancies Quantis and EA. Founded in 2003, the European Outdoor Group has grown into a high profile, dynamic organization that fully represents the outdoor sector. The European Outdoor Group was originally founded in 2003 by 19 of the world’s largest outdoor companies, all of which recognized the need for a cohesive, cross border approach to represent the outdoor sector. Sympatex has joined the EOG in 2018. Sympatex is member of Textile Exchange which is a global organization that works closely with its members to drive industry transformation in preferred fibers, integrity and standards and responsible supply networks. Textile Exchange identifies and shares best practices regarding farming, materials, processing, traceability and end-of-product life circle in order to reduce the textile industry’s impact on the world’s water, soil and air, and the human population. The Textile Partnership is a multi-stakeholder initiative with the aim to reach social, ecological and economic improvements along the complete textile value chain. Sympatex has been a member of the association. In order to reach the association’s aim of creating a sustainable textile value chain, each member develops a roadmap once a year. It contains realisation requirements that every member works on for the respective year.